National Margarita Day is coming up on Feb. 22, and folks around the country will be celebrating with the CoronaRita – a deliciously fun twist on the margarita. 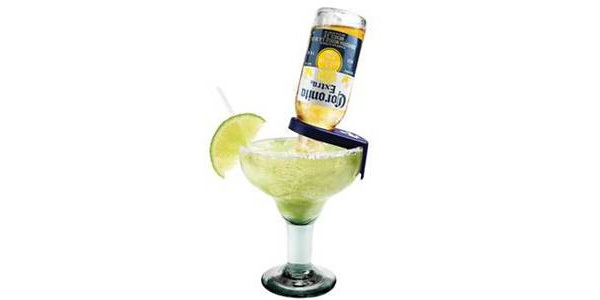 The CoronaRita is a traditional or frozen margarita that is accompanied by an upside down Corona, which slowly seeps into the margarita while the cocktail is being consumed, infusing it with subtle yet distinct Corona flavor. With the margarita as the #1 ordered cocktail and Corona Extra as the #1 ordered import beer, the CoronaRita is perfect for entertaining guests during National Margarita Day celebrations, Cinco de Mayo and throughout the Summer. The CoronaRita below is made with Coronita, a 7oz. bottle of Corona Extra. Corona Extra is the #1 imported beer in the U.S. and the #5 beer overall. Corona offers the perfect balance between heavier European imports and lighter domestic beer, pairing well with spicy cuisine, casual dining, and of course, limes. Print article This entry was posted by Art Eddy III on February 19, 2014 at 9:04 pm, and is filed under Lifestyle. Follow any responses to this post through RSS 2.0. Both comments and pings are currently closed.